Availability: In Stock., 31 Available. 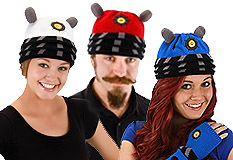 Dare you wear the Dalek Beanie in public? Only if you are willing to show your genocidal tendencies to an unsuspecting populace!